We realized that some people may not be familiar with the Enneagram so many of these blog posts will be a little like reading a foreign language so we thought writing a brief intro to the system and the Nine types would be beneficial for those not acquainted with the system. The Enneagram has unclear beginnings that can be traced back as far as ancient Babylon and ancient Egypt which makes theoretical attribution difficult due to its inherently oral nature. 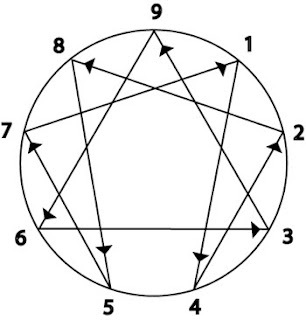 The word Enneagram is translated into “nine diagram” which points to the geometric figure that represents the system as a whole (see figure “a”). With nine equidistant points drawn inside of a circle, the symbols use as a theoretical model are likely mathematical and were discovered by mathematician Pythagoras (Riso and Hudson, p.12 1996). The symbol was thought of as a pictorial/geometric representation of the “process of renewal” and was likely passed down generationally from the Greeks to the Arabs and Moslems in the early 14th and 15th centuries (Riso and Hudson, p.12 1996). Ebert et. al, 1991). The Enneagram model was adapted as a personality typology and rediscovered by George Gurdjieff who claimed to have discovered it from the Sufi’s in his travels in the early half of the twentieth century, however due to the various tall tales told about Gurdjieff’s life and his reputation amongst some scholars as a Charlatan there is no precise way of knowing how he came to understand the Enneagram model as a psycho-spiritual typology (Riso and Hudson, p. 14 1996).
. So, from the theories relatively esoteric and mysterious beginnings an in depth psychological system was born that, with all it’s various permutations and variations, boasts nine types and over fifty four subtypes. (8,9,1) are characterized by a focus on their ability to instinctively move through the world and the space to exist, they typically have issues surrounding anger, resentment, repression and appetite. Due to the inherent complexity of the system and its growth in popularity in the early 1980s and another surge of interest in the early 1990s the Enneagram was adopted to many disciplines including organizational communication and business development. Authors like Michael Goldberg and Helen Palmer have focused on uses of the Enneagram in team building to help managers and peers understand work habits and motivational goals more to assist in business growth (Goldberg, 1996; Palmer, 1995). In addition to organizational communication, helping disciplines have adopted the model in interpersonal modes of communication however primarily in a clinical atmosphere. Due to the Enneagram’s inherent focus on motivation and behavioral presentation it gained some popularity from marriage and family counselors and corporate and life coaches to assist in producing methods for conflict resolution and relational maintenance (Baron and Wagele, 1995). Since the popularization of the Enneagram several Enneagram personality tests and scales have been validated including the Essential Enneagram Test validated by Dr. David Daniels at Stanford University and the WEPSS (Wagner Enneagram Personality Style Scales) developed by Jerome Wagner, Ph.D of Loyola University (Daniels and Price, 2000). In addition to the aforementioned tests Don Riso and Russ Hudson have conducted several private validation studies through SHL, an independently owned occupational testing facility based out of the United Kingdom, and found statistical correlation between the RHETI (Riso Hudson Enneagram Type Indicator) and SHL trait based personality test as well as the more widely known Myers Briggs and Big Five personality systems (Enneagram Institute, 2005). 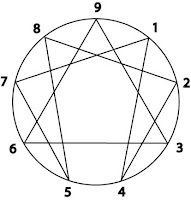 The Enneagram also has a dynamic quality that means that there is movement within the system. The types move against lines of connection or arrows in which they sort of "pick up" both positive and negative traits of the type in the direction of the arrows. So for example the 1 who is normally rational, tempered, measured and disciplined MOVES WITH the arrow toward 4 where they can become moody, temperamental, entitled as well as more creative, in touch with their feelings, intuitive and aesthetic. 1s can also MOVE AGAINST the arrow toward 7 so they can learn to stop focusing on work so much and relax and have fun, be more spontaneous and allow their imaginations to "drive the bus", alternately they can become more scattered, permissive with themselves, gluttonous, and unrealistic about their expectations. It used to be believed that a type moved one way toward health (integration) and the other way toward pathology (disintegration). However, I have found that this isn't true, and other teachers have confirmed this. Some have a stronger connection one way or another. Typically it is harder to move against the arrow (against the grain, if you will), so it was believed in order to find psycho-spiritual stability one should try and integrate the type behaviors against the line of connection. The Enneagram as most people use it today has evolved into a highly dynamic system and for my purposes I find it most useful when synthesized with other systems to help get a clearer picture of the totality of the individual. There are some teachers who utilize this method best, In my opinion Katherine Fauvre and David Fauvre's synthesizing method a good mixture of both scientific logic and intuitive insight. Tom Condon's approach is also appealing as he recognizes the elasticity of the system and does some really interesting work with hypnosis and NLP terminology as it relates to how we conceptualize our types. My doctoral research with the system is geared toward how it relates to communication (both interpersonal and intrapersonal) in addition to some critical issues regarding the types and how cultures conceptualize individuals of certain types. In other words; how we support certain personality types in our culture and chastise the behavior of others. The positive and negative effects of that social pressure on those individual types and how they mitigate those societal expectations is also of interest to me and something I hope to explore in my research.